But surprisingly didn't get the results I expected. Turns out firstly I had the arguments to map the wrong way around, but before realising this I also noticed that my original source object was also getting updated. Wat?!? After checking the docs I realised both jQuery and Underscore/Lodash refer to the first object passed to the extend function as the destination object. So while the function also (curiously) returns this destination object, it is in fact mutated in-place as part of the extend operation. Simple enough. So library writers please try to be immutable by default. I spent more time than I'd like to admit reading and stepping through the code to work out what was going on, and just found myself going round in circles. I thought this would have fixed it, but no... I can see that my check as to wether or not the datepicker is visible is working, and am confident it's required... but the date is still being set incorrectly and needs two clicks. Unfortunately there is no mention in the docs that calling any datepicker methods from within this handler could lead to undesirable results... Gah! I'm only trying to set the date to the 1st if the datepicker is open, but also only accessing the current date of the control when this is the case. This means that when the handler fires after the date has been set programatically it won't step in and bugger things up. My take away from this is a reminder as to the complications and dangers of managing state, and how immutability makes things safer and less unexpected. I took a look to see if I could contribute this note to the official docs but there was no obvious way to do so. Which then avoids the second gotcha entirely! Today I ran into an interesting (though afterwards 'doh! of course...') problem involving a slow MySQL query that should have been a hell of a lot quicker. The application I work on supports users in many timezones, so when it comes to query time we always need to adjust system recorded times (which are always UTC) to allow for the users current timezone. Given a relatively small number of rows you'll have no problem with this, but open the EXPLAIN output and you'll notice MySQL ignores the index. I suppose it makes sense that MySQL is now unable to use the index, it's an index on the date_created column, not on the date_created_plus_some_timezone_ column. So the fix is to move the date wrangling to the query parameter instead. Notice how the sign on the INTERVAL modifier changes as we're moving the date the other way. You could of course do this calculation on the date before binding it to the query, but in my case we often need to do the INTERVAL adjustment on the column itself so it's nicer to keep it in one place. So how to render this... let's pretend you didn't read the title of this post, and I'll tell you the first thing I considered was to use SVG. But I don't really know anything about SVG... so as well as having to start from scratch from an implementation point of view I've also no idea about the trade-offs of deploying it. So I thought I'd try using CSS. The basic plan I had was to draw two rings, the green one placed infront of the grey one. I hoped that I could use percentage sizes inside a container to allow the whole thing to flex and move with the page. As you can see from the code above I'm not worrying too much about backwards compatibility here, I'm lucky enough to be in the position where we can expect a modern browser. It's fairly self explanatory so I won't go through it. 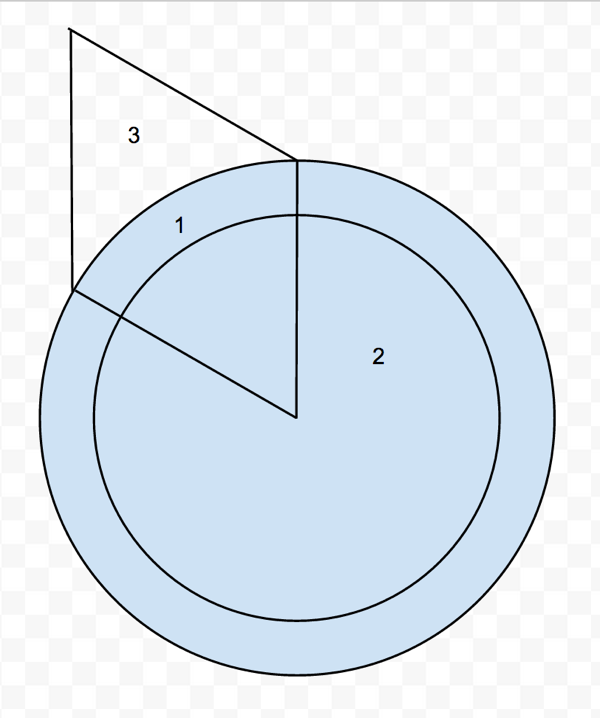 The only thing to note is the offsets and calcs which make the circle slightly inset (which will become important when drawing the green portion as it's a wider ring that overlaps on both sides). Here's the code for the first segment, 0-25%. The completed thing looks great, and resizes really nicely with the page. Obviously if you don't have a modern browser then you're going to see an absolute mess, but that's ok for my case. As I mentioned at the start of the article I didn't choose to use SVG because of my complete lack of knowledge of it - but I'm really pleased with how it came out with CSS. If I've missed some tricks and there are actually much simpler ways to do this then I'd love to hear about it so leave a comment. So how to use my lovely listing templating here?